in October of last year, our first course attracted more than 145,000 students - and more than 30,000 finished the course and earned a certificate of completion. In this course we’ll dive deeper into the details of how the platform collects, transforms and organizes the data you see in Analytics. Understanding how these processes work is the first step to refining your implementation and uncovering more valuable insights about your business. Registration is now open and the course begins March 11, 2014. You can sign up here. It’s never been a more exciting time for businesses as technology is driving innovation at an astounding rate. With the introduction of mobile devices (and tablets) and the ability to understand user behavior - the fundamental way that we do business is changing. And the key driver is data. All of these new technologies create information - data that we can use to better understand the needs of customers. If we understand the customer better, we can help them achieve their goals, while we achieve ours. Nowhere is this more evident than in digital marketing and digital advertising. 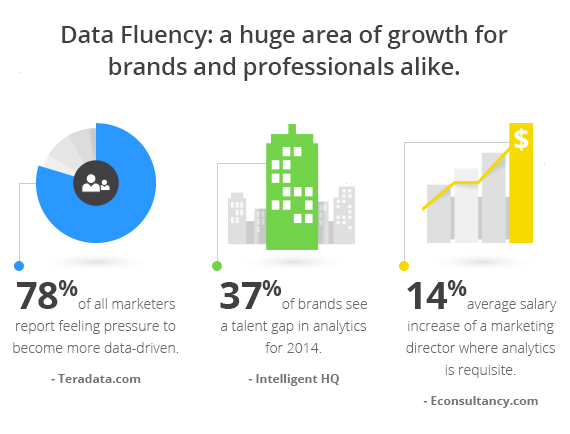 78% of marketers feel the need to become more data driven and almost 40% of major brands see a talent gap in analytics. Marketers need to know how their campaigns drive direct conversions, and more importantly, how they improve the overall performance of other campaigns. This can be an imposing task for someone that doesn’t know the difference between a conversion and bounce rate. No matter what your role in business, from marketing to product to PR, you will need to work with data. Luckily there many opportunities for all of us to learn. Make 2014 the year that you invest in yourself and develop your analytical skills. To paint the picture of the opportunity, we also created an infographic to get you excited about embarking on your own personal analytics education (see a preview below, but view the whole graphic here). We hope to see you at our MOOC in class! We’re excited to help digital marketers become more data savvy through the Analytics Academy. Initially launched in October of last year, our first course attracted more than 145,000 students - and more than 30,000 finished the course and earned a certificate of completion.